The Balfe Motorsport Team lined up in second place on the FIA GT2 grid at the French Grand Prix venue of Magny-Cours, following another superb qualifying performance. The Mosler MT900R once again aimed to take the fight to the factory backed Porsche 911 GT3-RSR team during the opening 45-minute session. Shaun Balfe set a time good enough for third place on the grid, as the circuit started to heat up in the extremely hot weather. A repeat of its Monza grid position was sealed by the end of the second, slower, afternoon session. 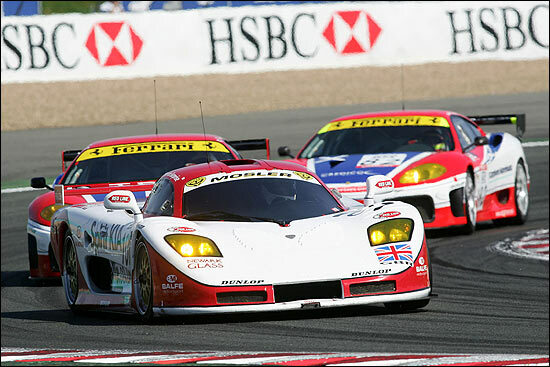 However, the morning times for the number 66 works Porsche were dismissed, meaning that it would start from fourth on the grid, promoting the Mosler up one place in the process. Jamie Derbyshire went out in the second half of the opening qualifying session, but suffered a minor set-back, when he was hit by one of the Saleen GT1 cars at the first hairpin. Derbyshire had seen the faster car in his mirrors and had left it plenty of room as they both went into the corner, only for the driver of the other car to cut across him just before turning in. 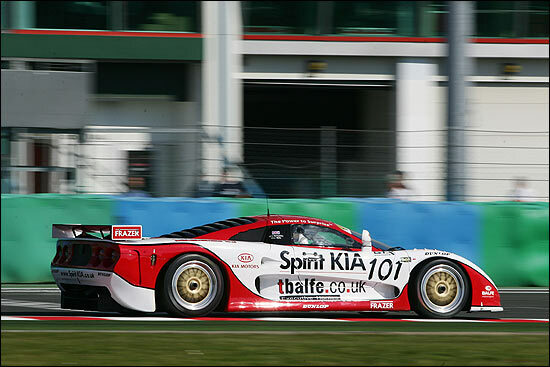 Jamie Derbyshire split the Scottish Ferraris in the race morning warm-up, and Shaun Balfe then started the race in the Spirit-KIA backed Balfe Motorsport Mosler, but had to concede his second place as the #66 Porsche worked its way past on the opening lap. However, a hard charging Balfe managed to stay with the leading pair for the opening handful of laps, before the hot track made it difficult to stay in contention. A great drive kept him almost 10 seconds clear of the chasing Ferraris, before he handed over the Jamie Derbyshire for the second stint - as the safety car was called out. Some slick pit-work by the team meant that Jamie resumed in third place, holding the Ferraris at bay for another 30 minutes of the three-hour race. Mechanical problems were to intervene on the team’s – so far – perfect run. A gear selection cable suffered under the intense heat and melted, leaving Derbyshire with no gears. He dived into the pits and the team decided to change the cable, sending Balfe back into the fray after losing almost 12 laps. A great effort allowed him to gain over a lap on the G2 class leader - until the same problem happened again, this time forcing Balfe out of the race. “It’s disappointing to not make it to the end of the race,” said Balfe. “The weekend started so well and we were looking good for a podium result behind the Porsches once again. But unfortunately the heat got too much for the cable and it meant that we couldn’t select gears when we needed to. Balfe Motorsport will next be in action at the ‘home’ race of the season, at Silverstone in just over two weeks’ time.